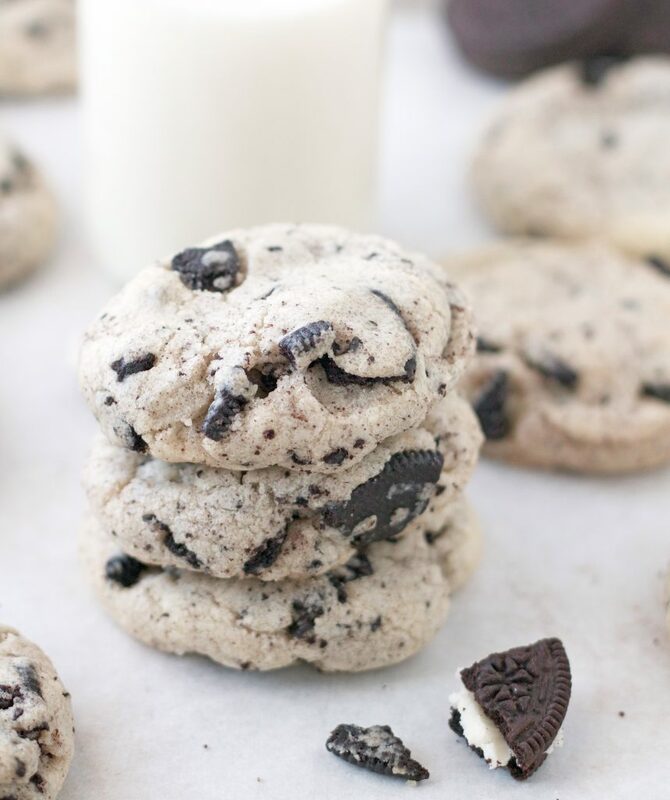 A soft and vanilla-y cookie packed with with chopped Oreos, these Cookies ‘n’ Cream Cookies are seriously amazing! Please forgive me for posting another cookie recipe so soon, but I couldn’t help myself. I held off sharing this recipe with you for as long as I could. You guys! These cookies . . .they’re kind of amazing, and fabulous, and ridiculously delicious, and instantly won us all over. 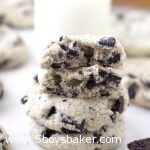 A sweet, vanilla cookie dough chock full of chopped Oreos. . .YUM! How could that ever be a bad thing? I guess if you hate Oreos it might be. 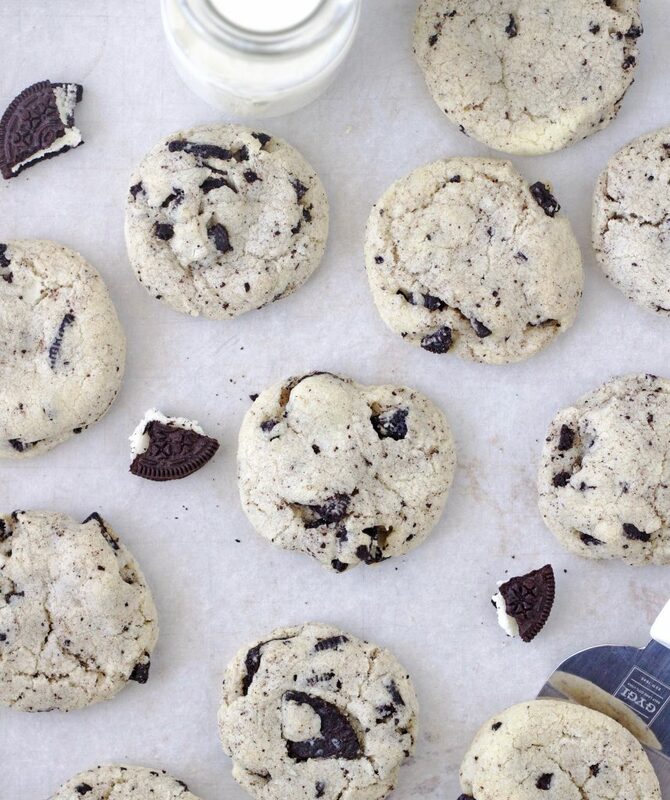 Pleeeease tell me you don’t hate Oreos, because if you do, you’re crazy! It’s pretty much a well-known fact that I love cookie dough as much as I love cookies, and THIS dough. . . . holy schnikes, it’s flipping amazing and dangerously delicious! I wish I would have remembered to take a pictures of the dough because it is seriously so beautiful (lol!). Before I even made these cookies the first time, I had every intention of adding chocolate chips to these cookies, but then I tasted the dough and I immediately vetoed that idea. It really is a miracle that any cookies actually got baked. If you’re smart enough to make these, let me know what you think. I love hearing from you. 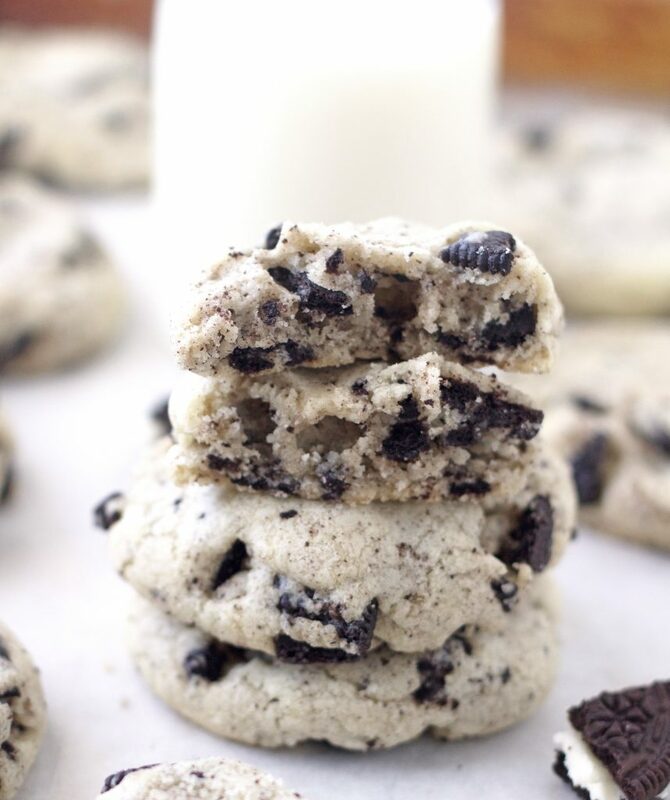 A soft and chewy vanilla cookie filled with chocolaty chunks of crunchy Oreos. In the bowl of a stand mixer fitted with the paddle attachment (or you can use handheld electric mixer), combine the butter, coconut oil, sugar, salt, baking powder and vanilla. Mix on low speed to combine then increase the speed to medium and mix for about 5 minutes until the mixture is light and creamy (scrape the sides of the bowl as needed). Add the egg and continue mixing until combined. Reduce the speed to low and add the flour, mix until combined then add the frozen Oreo pieces and continue mixing until well combined. Scoop the cookie dough into 2-tablespoons portions then using your hands, roll each scoop of dough ball until smooth and round. Arrange on prepared cookie sheets leaving 2-inches between cookies. With the palm of your hand, gently flatten each dough ball into a 1/2" disk. Bake for 10 to 12 minutes or until puffed and firm around the edges (cookies will still look pale and underbaked). Cool on baking sheet for a couple minutes then transfer to a cooling rack. If you bake these until the edges just barely start to turn golden brown, they will end up being fairly crunchy once they cool completely. So if you prefer a softer cookie, just make sure you bake them until they're puffy and the edges look set, just not golden. Can these be frozen? Making them for an after school Good News Bible club. Looks like something children would love. Hi Sharon! Yes, these can be frozen, just make sure you take them out of the freezer a couple hours before serving them. Hope they enjoy them.